Today I'm gonna share some goodies that I have from Ruth Romano with you! 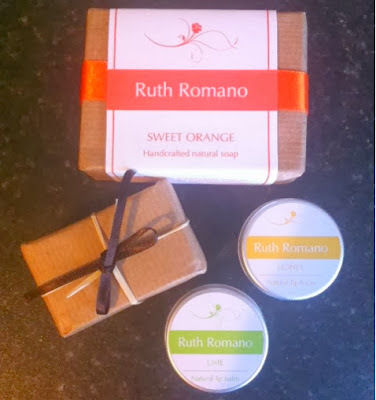 Ruth Romano is a small line dedicated to producing natural skincare products. After reading Ruth's story I can now say that in the future I am going to try and keep an eye out for skincare products with all natural ingredients as many products found on the market today contain chemicals that are potentially harmful to our skin. Not only that, but many soaps and other skin products contain 'palm oil'. The problem with using palm oil, is that the demand for it is so great that habitats are being destroyed, putting the surrounding wildlife at risk. If you want to read more about Ruth and her story you can find out the in's and out's of the type of ingredients used over on her website, which I will leave below! The first couple of products from the range I have to show you are both soap bars. The first in 'Sweet Orange' and the second in 'Cedarwood and Pine'. The Orange soap bar is the most gorgeous smell ever, it is very reminiscent of the orange scented products that the body shop have except this is no where near as over powering. This soap also contains oatmeal which is great for giving the skin moisture! The Cedarwood bar has a very woodland smell, as expected, and smells very fresh and natural. If you're the type of person who loves to be outdoors The bar is blended with poppy seeds to exfoliate the skin. Both soap bars contain naturally occurring essential oils, which are great for hydrating the skin. I rarely use soap in a bar form, but as these are so beneficial I will be rethinking my skincare choices! Both soaps left my skin ultra soft and I was surprised at how hydrated it left my skin! The next couple of products I have to show you are two lip balms in the flavours, 'Honey' and 'Lime'. I was very intrigued by these lip balms as the flavours are unlike any on the market! Most lip balms are typically either strawberry flavoured, or something else along the lines of berries. So I was very excited to try these! The Honey flavoured balm is very soothing and not at all sticky which you find with a lot of balms, yet still prevents your lips from becoming dry. The Lime balm is also soothing and moisturising, with a wonderful scent which is fresh and sweet, yet not over powering! I would most definitely recommend these to anyone who is looking for a more natural alternative to their current skin regime. I also think these products would be great as gifts maybe for a birthday or christmas as they are beautifully packaged, and not at all expensive in my opinion! Products provided by Ruth Romano. All views are my own.